How compatible are Libra women and Aries men mentally, emotionally and sexually? The air sign Libra and the fire sign Aries are at opposite ends of the zodiac spectrum, meaning this relationship has its strengths and weaknesses. The female scale is about balance and the male ram is about excitement. If the Libra woman and Aries man want to combine the two it will take much effort. The Libra woman is concerned with what’s right, whether it be an argument, her career, or where to go out that night. She tends to be indecisive, but only because she wants what’s best. This is confusing to the Aries man, who goes with his gut feeling every time. But Libra women are social and flirty, and Aries men are attracted to her fun personality. She, in turn, enjoys the mind games he likes to play. The Libra woman and Aries man connect on a mental level first, discussing a variety of topics all night. He has plenty of stories to tell and she loves listening to people’s adventures. Eventually, this Libra woman Aries man attraction will cause both sun signs to want to take things further. He is bold and charismatic and she is playful and charming, which is a great combination to lead things into the bedroom. In sexual compatibility the Libra woman Aries man couple are two sides of a different coin, for the Libra woman enjoys being in love while the Aries man is full of passion. She can start things off with romance and affectionate gestures and he can finish the night with a powerful climax. And she has no problem with him taking the more dominant role in the bedroom, as long as she feels it complements the situation best. The masculine Libra energy is usually a positive match with her feminine energy, so the Libra woman and Aries man should be able to find the right solution to suit both their sexual needs. And once these two zodiac signs commit to each other, the Aries male will remain fiercely loyal and the Libra woman is in it for life. The Libra woman Aries man can help each other along the way, like when Libra has a great idea but has trouble following through. Aries can assist in making it happen, as he makes anything happen when he puts his mind to it. If the Libra female doesn’t understand her Aries partner, there may be problems between the sheets. He automatically takes the lead physically, but she at times may want to control the situation through her ideas. This will be a struggle, unless they can find a way to combine the two methods. Excellent love compatibility and of fidelity will be necessary to keep the Libra woman Aries man couple together, for other problems will arise in time. The Libra’s constant need to analyze everything will drive the Aries crazy. So the Aries male should try to teach her how to listen to her intuition and go into things based on instinct. The Libra woman, in turn, can teach him patience and love as he tends to dive into things too quickly. She is looking for harmony and this is the only way to achieve it for these two. They will just have to be careful to stay on the same page. If the Libra woman Aries man pair get into an argument the Aries’ quick temper will come out and not mix well with Libra’s desire to discuss every possible solution. He will have to tone down his arrogance and she will have to work on standing up to him if both star signs are to be happy together. 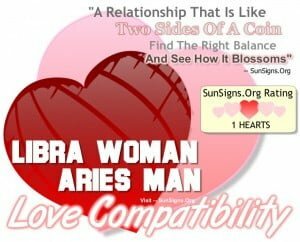 Libra is a cardinal air sign whereas Aries is a cardinal fire sign, the Libra woman Aries man compatibility gets a ONE Hearts rating. If the Libra woman Aries man can find the right balance, then watch them soar! I, 24 y/o Libra woman, fell in love with my, 31 y/o Aries man, neighbor. We fell in love with each other. I have never been in a relationship that is this compatible. I do have to say though, that we used to carry some negative traits that comes with being the signs that we are. I must say though, being with an Aries man has taught me how to be more confident with my self and the decisions I make. He has also taught me a lot about responsibility and tackling any task or goal that I need/want to get done. In return, being a Libran, I can see that I have taught him, and am still teaching him about seeing situations from a different perspective, which makes great conversations. I love how he patiently listens to me when I explain the other side of a situation that he hasn’t thought of. I can see his gratitude instantly. To any Libran woman who is reading this, if he loves you (which you should be able to tell right away with an Aries which is so great about them) he will never let you go, don’t let him. And what about a libra sun with taurus moon would fit an aries man?…would the moon make it worse or better?